Visits: 57697 persons viewed this recipe. Cherupayar payasam – everybody likes to have a little sweet after having a great meal. Here is the recipe of a popular Kerala dessert which can be served on your sweetest occasions. 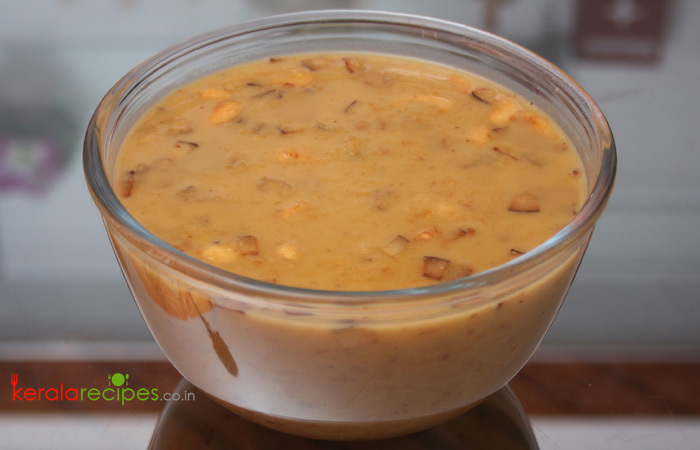 The key ingredient of cherupayar payasam is split mung bean (cherupayar). It is wonderful when it is served with ‘poovan pazham’ and ‘pappadam’. Roast the split mung bean in a pan by stirring continuously in a medium heat, till golden color. Remove from the heat, wash it well and drain it. Next, cook the mung bean by adding 4 cups of water in a covered vessel till done (medium heat). In the meantime, crush the jaggery and make a syrup by boiling it with ½ cup water. Strain it for impurities. When the mung bean is cooked well, pour the jaggery syrup into it. Stir continuously till it thickens. Add dry ginger powder, cumin powder and cardamon powder. Stir it for 1 minute. Remove from the flame and add 1 cup of thick coconut milk. Combine well. Heat 2 table spoons of ghee in a pan. Fry coconut slices and cashew nuts one after another. Add this (along with ghee) to the prepared cherupayar payasam. 1) Instead of using water for cooking mung bean (cherupayar), you can use second and third extract of coconut milk. Hello Shaan, Cherupayar Payasam is a very tasty Kerala dessert like Ada pradaman. I like both, I think as you said in the tips, second and third extract of coconut milk maybe good instead of water. Thanks for this super tasty dessert. Hi Jayaprakasan, Thank you very much for the comment. Great to know that you loved it. Hello Sir, I was going through this cherupayar payasam recipe. Instead of cherupayar I am going to try kadala payasam with the same procedure… It is holi so I wanted to share this sweet dish… thankyou Sir…. Tip from her: She adds 1/2 kadalippazham (nicely mashed) after adding thick coconut milk (first extract of coconut milk) to enhance the taste and take away the bland taste of cherupayar. Hi Rajitha, Thank you very much for the tip and also for taking time to share it here. Hope it will benefit other who is going to prepare cherupayar payasam. Really its very tasty. Thank you so much. You are welcome Rohan. Thanks for the feedback. Thank you very much for this yummy payasam. Its very tasty and very easy recipe..
Sujitha, Thanks for the feedback. Hope you will try other desserts too. Thanku you Shaan for tip, but when I cooked mug beans in coconut extract, need long time for cooked. I was so desperate. You are welcome Moly. Instead of cooking beans in covered vessel you can pressure cook it. Hope that will save your time. Thanku Shaan.I like Kerla dishes. Thanks Shaan, for this tasty payasam. You must write the method of preparing in Malayalam also. You are welcome Suma. Thanks feedback and also for the suggestion. Hi Shaan, I appreciate you to your passion for cooking and food. I have two kids- boys. My elder son aged 10, he is also like you. One suggestion for your cherupayar payasam ie, after cooking cherupayar, fry it in ghee few minutes for sweet smell and taste, then add jaggery and continue your methods. Hi, Shaan its great to have a IT professional in this Payasam corner. Your recipe is simple and sweet, this time I will try this for Onam. Instead of coconut milk can I use milk? Mini, Thanks for the feedback. Do not add milk in cherupayar payasam, it will curdle as we are adding jaggery in it. So add only coconut milk. Hi Shaan, I am from Malaysia. I have tasted Kerala payasam before but didn’t had the chance to try to cook. Tx for sharing the recipe. Uma Maheswary, Thank you very much for taking time to share your comment here. Hope Cherupayar Payasam will turned out good for you. Please share your experience. Hi Shaan, the payasam tasted so delicious. Tx again for sharing. I am going to prepare the payasam again this weekend and I plan to replace the coconut milk to condense milk. Hope it turn out well. Uma, really glad to know that you love this cherupayar payasam very much. We can not use normal milk as an alternative to coconut milk. As we are adding Jaggery, the milk will curdle. So I am not sure about adding condense milk. Dear Shaan, As per your profile you said you have the habit to taste the different food on travel. How you maintained your health? Your recipes are super. Thanks for the recipe. Can we use whole mung bean instead of split?? Femina, I haven’t tried it with whole mung bean. But I think it will work out well. Wow, I really like to drink payasam especially ada payasam and parippu payasm, u r recipe is very interesting, Sure I will try u r recipe this Onam. Thanks. Dr. Madhu, Glad to know that you love payasam very much. Waiting for your feedback, Happy Onam in advance. Aswathy, Really happy to know that you prepared the payasam very well and got appreciated by friends and family members. Thanks a lot for the feedback. Thank you for the awesome payasam recipe. Your tips were really very helpful. Thank you. Dear Shaan, can you pls add the step by step pic of every recipe. It will much helpful for beginers like me. Soumya, Thanks for the suggestion. I will try to do it.